The news has been pretty grim and stock prices in the alternate energy sector are so low that many are at their all time lows right now, possibly an opportunity, or not. 30% anti dumping tariffs will result in the Chinese moving manufacturing to other locations in Asia resulting in marginally higher cost and benefit to US cell manufacturers. US tax credit for wind is set to expire at the end of 2012 with no sign of an extension yet. Natural gas prices while having risen sharply recently yet remain at historically low levels creating challenging conditions for development of wind, solar and geothermal. Important markets in Europe are in financial distress. Japanese feed-in tariffs are very generous currently. Proposed cuts in German and UK feed-in tariffs for solar have been delayed. Chinese feed-in tariffs have been generating strong growth in installations. The US market for solar has exceeded expectations. The price of solar in Germany and Spain is sufficiently low that large scale unsubsidized installations are occurring. Shade from a tree can lower the surface temperature on your façade by up to 45 degrees, and a 15” diameter oak can save you as much as $130 annually. 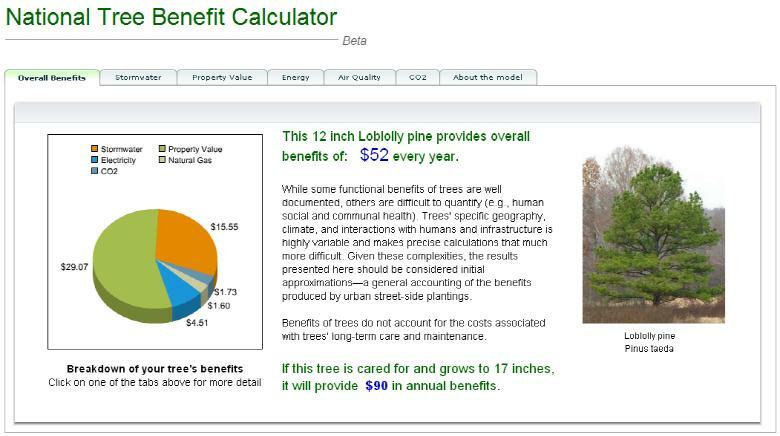 See what the benefits you might have by checking out the calculator at www.treebenefits.com/calculator.